Dunder is a hip casino with a great urban vibe! This casino was launched in 2016 by a team of Swedish casino enthusiasts who decided to combine their passion for the industry and create a casino that focuses on user-friendliness. And when it comes to easy navigation, we can honestly say they’ve accomplished their mission. In fact, Dunder is one of the few casinos that has advanced filters. So, finding your favourite gamed by category, genre or feature is simple on this site. And who knows, thanks to their advance filter system you may also discover a new favourite amongst the 600 games offered. 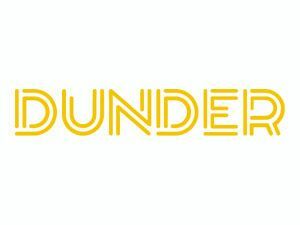 Dunder is a casino that operates under GIG MT Secure license. Which means that on top of benefiting from a very stable casino, you’ll also have many easy to use payment methods if you want to take advantage of the welcome bonus they offer. Dunder sure knows how to treat players well! In fact, after validating your new account, you’ll get 20 Free Spins on the popular Starburst game by NetEnt. After playing your 20 Free Spins, you can either decide to continue playing on this all-time favourite. Or use the money you’ve just won to discover new games. What’s more is that if you like their fresh lobby and decide to continue playing there. Then you’ll have the chance to claim a 200% bonus up to £50, and you’ll receive an additional 180 Free Spins on Starburst. Afterwards, if you still want to continue playing, you’ll have the option to deposit again and claim a second and even a third welcome bonus. Dunder’s Welcome package is worth a minimum of £600. Well, if you don’t consider all the money you’ll win with your 200 Free Spins! What’s important to know about Dunder Casino and the Bonuses? The experience of Dunder’s team is not only reflected by how well players are treated. But also, in how clear their terms and conditions are. In fact, you’ll find all the information you need to claim any offers one click away. But if fine prints are not your thing, then here are a few guidelines you should keep in mind if you claim the 200% bonus up to £50. The first requirement you’ll need to meet to activate the bonus is the minimum deposit amount of £20. After claiming the welcome bonus, you’ll need to fulfill the wagering requirements of 37.5x applicable only on the bonus money. Also, after making your first deposit remember to come back to the site for the next 9 consecutive days (at least). Doing so means that you won’t miss out on the 20 daily Free Spins you’ll receive on Starburst. If you forget to claim your 20 Free Spins after validating your account. Don’t worry! You have 7 days to play them! And if you get lucky, Dunder authorise players to withdraw as much as £1000. Well providing you meet the 25x turnover requirement on your winnings. Try Dunder Casino 100% risk-free today! Claim your 20 Free Spins on Starburst now and have fun!